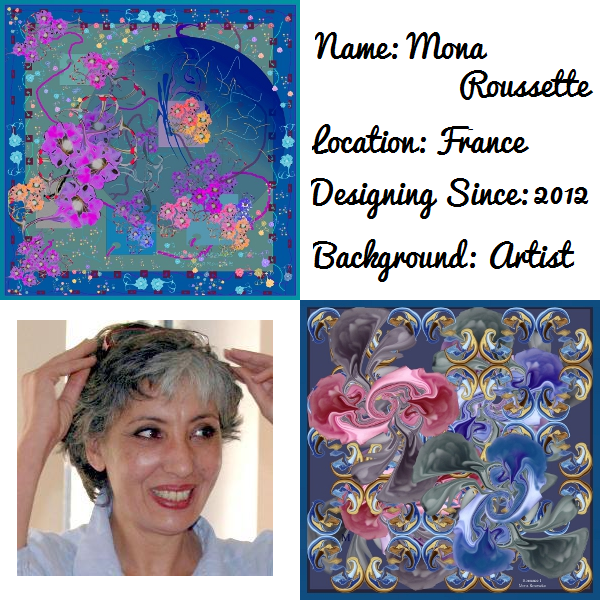 It's with great pleasure that I introduce you to two silk scarf designers, both named Mona, who are creating keepsake carrés true to their artistic vision an ocean apart. Vancouver-based Mona Sultan favours bold graphics and on-trend colour combinations in her designs, and draws inspiration from such eclectic sources as graphic design, architecture, and history. Meanwhile, Mona Roussette—who hails from France—weaves surrealist, kaleidoscopic dream-scapes into hers. 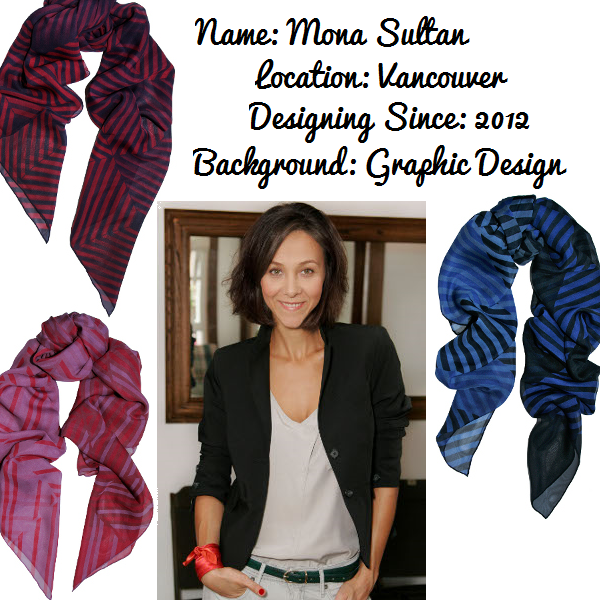 Find out what makes each Mona's silk scarves, well, uniquely Mona. In 3 words, describe the aesthetic of your silk scarf designs. I am a very nostalgic person and I draw most of my inspiration from the past, be it my own or history in general. I also find a lot of inspiration in my travels. Over the years I have found myself greatly influenced by artists such as Andy Warhol, Guy Bourdin, Sarah Moon and Man Ray. For day, how would you style one of your scarves? For fall, I would style it with tapered leather pants, loafers and a chunky sweater. The scarf would be loosely wrapped around the neck. For evening, how would you wear one of your scarves? Wide leg pants, silk camisole, gold belt, oversized clutch and a pair of killer heels. For evening, wrap the scarf several times tight around the neck and tuck then ends for an elegant finish. Fill in the blank: "For my next vacation, I'm travelling to..."
I find my inspiration from all aspects of life. Some days I am inspired by the ocean, other days it is by the crowd of people walking around the city. I would style it as a knotted scarf that is tied around the neck or a knotted scarf that is spread over the chest. A headband style scarf is great for the daytime as well. I would wear a scarf around the neck with an elegant dress for a nice dinner, cocktail party, romantic rendezvous, etc. A headband style is fun on a chic short dress for going out to a club. Styling a scarf around the shoulders or low under the neck are both sophisticated ways to wear one in the evening. Fill in the blank: "For my next vacation, I'm traveling to..."
Mona Roussette's pieces are gorgeous - love the colors and design! I'm partial to Mona Sultan's striped numbers. Do you have a favourite?